" Frazzini and Pedersen’s (FP) Betting Against Beta (BAB, 2014) is an unmitigated academic success. Despite being widely read, and based on a fairly simple idea, BAB is not well understood. This is because the authors use three unconventional procedures to construct their factor. All three departures from standard factor construction contribute to the paper’s strong empirical results. None is important for understanding the underlying economics, and each obscures the mechanisms driving reported effects. Non-standard procedure #1, rank-weighted portfolio construction: Instead of simply sorting stocks when constructing the beta portfolios underlying BAB, FP use a “rank-weighting” procedure that assigns each stock to either the “high” portfolio or the “low” portfolio with a weight proportional to the cross-sectional deviation of the stock’s estimated beta rank from the median rank. Non-standard procedure #2, hedging by leveraging: Instead of hedging the low beta-minus-high beta strategy underlying BAB by buying the market in proportion to the underlying strategy’s observed short market tilt, FP attempt to achieve market-neutrality by leveraging the low beta portfolio and deleveraging the high beta portfolio using these portfolios’ predicted betas, with the intention that the scaled portfolios’ betas are each equal to one and thus net to zero in the long/short strategy. FP’s first of these non-standard procedures, rank-weighting, drives BAB’s performance not by what it does, i.e., put more weight on stocks with extreme betas, but by what it does not do, i.e., weight stocks in proportion to their market capitalizations, as is standard in asset pricing. The procedure creates portfolios that are almost indistinguishable from simple, equal-weighted portfolios. Their second non-standard procedure, hedging with leverage, uses these same portfolios to hedge the low beta-minus-high beta strategy underlying BAB. That is, the rank-weighting procedure is a backdoor to equal-weighting the underlying beta portfolios, and the leveraging procedure is a backdoor to using equal-weighted portfolios for hedging. 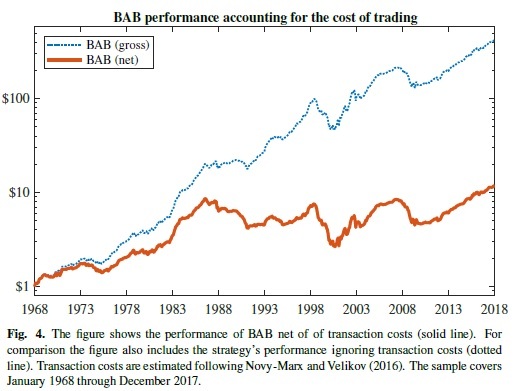 BAB achieves its high Sharpe ratio, and large, highly significant alpha relative to the common factor models, by hugely overweighting micro- and nano-cap stocks. For each dollar invested in BAB, the strategy commits on average $1.05 to stocks in the bottom 1% of total market capitalization. These stocks have limited capacity and are expensive to trade. 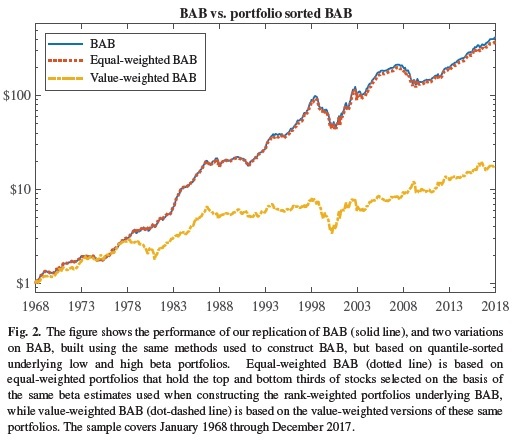 As a result, while BAB’s “paper” performance is impressive, it is not something an investor can actually realize. Accounting for transaction costs reduces BAB’s profitability by almost 60%. While it still earns significant positive returns, it earns these by tilting toward profitability and investment, exposures for which it is fairly compensated."